We finally come to the end of our season tomorrow after coming so close to extending it via the play offs. That defeat at Rushden on Monday didn't help our hopes but Wrexham finally wriggling out of a possible points deduction yesterday afternoon did confirm the end of our dream. Yes it was clutching at straws relying on the misfortune of another team but it's only human to wish such a thing and at the end of the day we should have done the job ourselves. It has been a fantastic season for us with many ups and downs. After a poor start, which is usual for us, we gathered ourselves together to go on an incredible unbeaten run of fifteen games starting at home to Barrow on January 22nd and ending at home to Darlington on April 19th. Even before that we were putting some good results together from the beginning of October when we beat Gateshead at home and then lost only twice more between then and the start of the unbeaten run. In that time we climbed the table from 16th place to as high as 5th at one stage but in recent weeks the tiredness crept in and we dropped out to the edge of the play offs never to get back in again. So tomorrows curtain dropper at home to relegated Histon brings to an end Steve Burrs first full season as the Harriers manager. What a fine job he and Gary Whild have done. We now need to sign our best players on contract for at least another season and strengthen in key areas to hopefully achieve similar next season. Tomorrow we'll be without Jack Byrne following his third dismissal of the season at Rushden. By all accounts he was supposed to have head butted a player but that incident was missed by many of the fans of both sides except for the eagle eyed who later claimed that was indeed the case. Personally, I'm a sceptic regarding the incident. Jack will also miss the first four games of next season and for that reason Lee Vaughan (right) will also be missing tomorrow (loanee Matt Lowe will make his first and last appearance in his place). Lee is on 14 yellow cards for this season and if he were to pick up a 15th tomorrow then he would be suspended for the first three games of the new season. It's not good to have two important players missing at such a crucial time so we're being very canny in this instance. 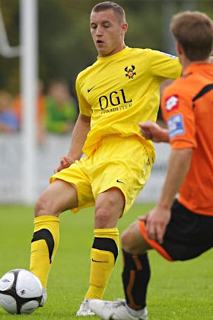 We'll also be without Sean Canham who was re-called back to Hereford on Tuesday. He blew hot and cold during his stay at Aggborough and considering he was Steve Burrs first choice target before the season started I think, or hope, he may have changed that opinion now and will go for someone like Marc Williams instead that can actually make his own goals and not rely on others to do all the work for him. Poor Histon; lovely club, lovely fans, unsustainable league status but a cracking pub nearby. They were hit with a five point deduction at the same time as we were but, whereas we overcame that and built ourselves into a side capable of promotion, they went the other way and seemingly gave up. They're now building for next season and the manager, Dave Livermore, signed a two year extension to his contract this week. Some fringe players have also been told they won't be kept on next season. Tomorrow they'll be without Omer Riza with a groin injury but apart from that have no other injuries or suspensions. All we need now is to get plenty of fans into the ground, don't forget the pointless late kick off, and make the game a celebration of a season that has surpassed all of our expectations. Thank you Steve Burr and thank you Kidderminster Harriers FC. Lewis, Stevens, Williams, Albrighton, Lowe, Byrne, Shaw, Briscoe, McPhee, Briggs, Hankin, Morris, Wright, Blair, Matt, Gittings. Lawton, Foderingham, Oyebanjo, Stewart, Okay, Clérima, Wootton, Murray, Sparkes, Attwood, Mills, Stevenson, Taaffe, Adjei, Smith, Livermore, York, Okojie, Asafu-Adjaye.